Police in Bangladesh have opened fired at a protest by former workers of a factory making clothes for western retailers that collapsed, who had taken to the streets to complain at their treatment by the authorities since the disaster six weeks ago. The protests took place close to the site of the former Rana Plaza factory, now entirely demolished, in Savar, Many garment factories are concentrated in the town near the capital Dhaka. The death toll from the Rana Plaza disaster now stands at 1,130. Hundreds of protesters, including former workers as well as relatives of victims killed or injured, were demonstrating to demand compensation or outstanding salaries promised by the government and the main body representing local employers in the booming industry, the Bangladesh Garments Manufacturers and Exporters Association (BGMEA). Protesters denied causing any damage. “We did not commit any vandalism but still the police opened fire and [used] teargas,” said Fatema Khatun, 20, a protester and survivor of the collapse, who said she had yet to receive outstanding pay. According to the local newspaper Prothom Alo, around 50 people were injured when police charged with batons. Police officials said any firing had been directed into the air. There have been several such protests in recent weeks. The BGMEA says outstanding dues have been paid. The clashes came as Alan Duncan, the UK minister for international development called for retailers who source garments in Bangladesh to assume responsibility for the clothes they sell “from the shop to the sewing machine”. On the first visit by a senior British official to Bangladesh since the Rana Plaza collapse, Duncan said such firms had a duty of care to those who made products sold on high streets. 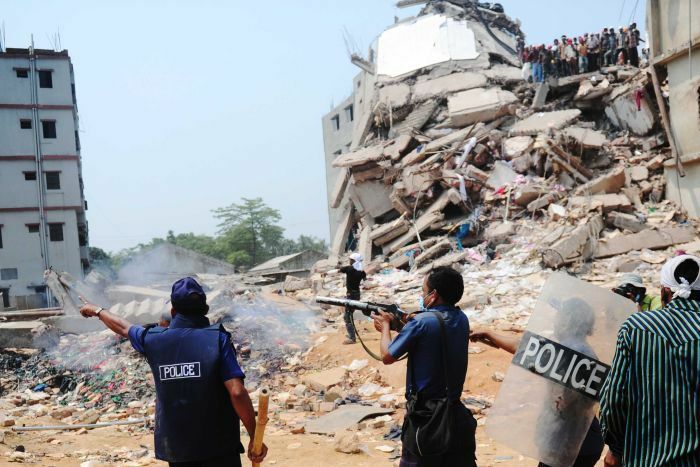 The British retailers Primark and Matalan have admitted sourcing clothes in the Rana Plaza factory. Official investigations have blamed poor construction and corruption for the collapse. The owner, Sohel Rana, has been detained. The garment industry in Bangladesh now exports $20bn (£13bn) of clothes each year. However, accidents are common. Last year, 114 people died in a fire. This entry was posted in ΝΕΑ ΑΠΟ ΤΟ ΜΕΤΩΠΟ and tagged ΚΑΤΑΣΤΟΛΗ, ΜΠΑΓΚΛΑΝΤΕΣ, ΤΑΡΑΧΕΣ on June 7, 2013 by simeioseis.